1970 Pontiac GTOs. Lot 91 of 95. CLICK-> Granada Gold 1970 Judge hardtop, Ram Air engine view. 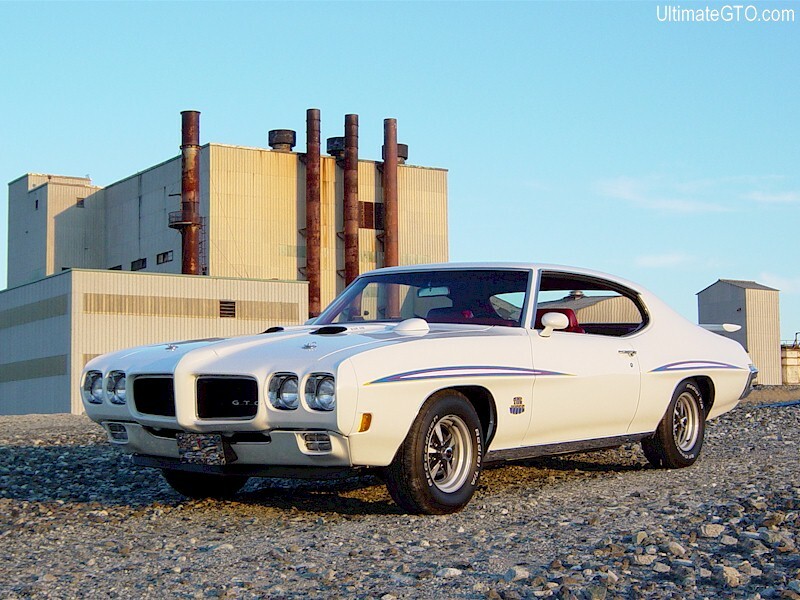 CLICK-> White 1970 Judge hardtop owned by Luc Gravel from Quebec, Canada. This was our Picture Of The Week for 10/16/05. This Judge has a red interior. This shot would look great as the wallpaper for your computer's desktop. We have it in two wallpaper sizes; 800-600 wallpaper and 1024-768 wallpaper. CLICK-> White 1970 Judge hardtop, left side view. What an awesome photo in an interesting setting. 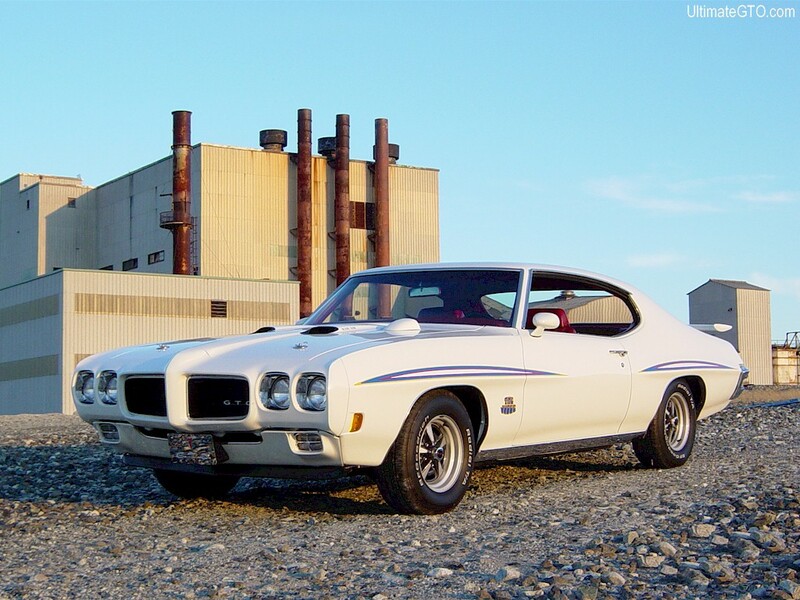 CLICK-> White 1970 Judge hardtop at the quarry. CLICK-> Pete Stack's 1970 Judge out in the Canadian snow. Pete explains, "I had an appointment to get my Flowmasters put on and when we got out of the shop... There it was... ugh Snow... She is tucked away in a garage now - warm and cozy waiting for spring!" This was our Picture Of The Week for 12/25/05. You can get this shot in two desktop wallpaper sizes; 800-600 wallpaper and 1024-768 wallpaper. 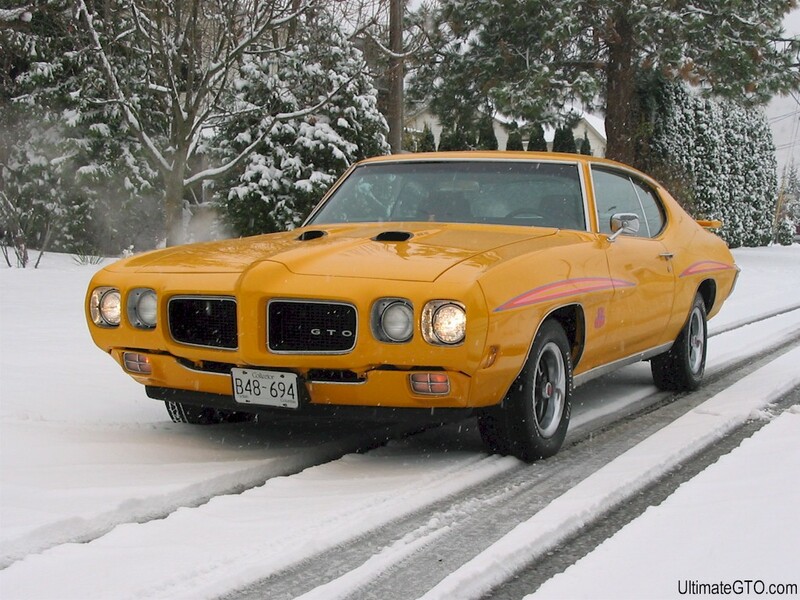 CLICK-> Another shot of Pete's Orbit Orange 1970 Judge in the snow. We have collected many other shots of this car. Click here to see them with the Advanced Picture Searcher loaded with year=1970, model=Judge, owner=Pete Stack. CLICK-> Cardinal Red 1970 GTO hardtop owned by Terry Sears from Moberly, Missouri. This was our Picture Of The Week for 2/19/06. Terry says this was his fourth GTO. Never heard of Moberly, Missouri? Moberly is known for its unique movie theatre setup. The Moberly "Five and Drive" consists of a five-screen indoor movie theatre and a one-screen drive-in theatre. It is believed to be the only combination indoor movie theatre and drive-in in the nation. CLICK-> Orbit Orange 1970 Judge hardtop owned by Steve Schatz from Wildwood, Missouri. This was our Picture Of The Week for 5/21/06. Steve tells us, "This was my first project car I bought in July of 2004. I bought it from a friend of the family and he had done a restoration on it after he purchased it from the original owner in 1986. At that point he changed the color from Verdoro Green to a custom red and he spent many dollars overhauling the original 400. By the time I got the car, it had been 18 years since any work was done. I have started over, first with spending the last year and two months in a friend's shop completing a frame-on restoration. I changed the color to Orbit Orange and added all the correct Judge striping, spoiler and badging - because I love the look! I still have a lot of work to do, but getting close." CLICK-> Left rear view of Steve's Orbit Orange 1970 Judge hardtop. CLICK-> Here is a shot of the front end of Steve's Judge during restoration. CLICK-> The body gets some attention in this shot. CLICK-> A fresh coat of Orbit Orange paint is applied to Steve's Judge. CLICK-> John Muraski owns this white 1970 Judge hardtop. This was our Picture Of The Week for 6/18/06. John tells us, "I am the only owner! I ordered this car in December 1969 and picked it up May 10, 1970. I had it restored last year." CLICK-> CBMcAlphin can’t wait until the restoration on his 1970 GTO is complete. This was our Picture Of The Week for 8/5/06. CLICK-> Shot down the right side of this 1970 GTO with potiental.